April, 1902. Sun. 13. Sharp frost, - fair day, cool. All in church morn, & evg. northerly. [Pres?] & [Mother?] with us evg. Mr. [Angrir?] died, at Castalia Rev. J.W. Neyman preached. Mon. 14. Light frost, fair. N.E. Fine day Very busy day. C. in short time. Evg. at office till 10:20. Filed 25 instruments. Tues. 15. Frozen again this morn Fair A.M. - Rainy evg. 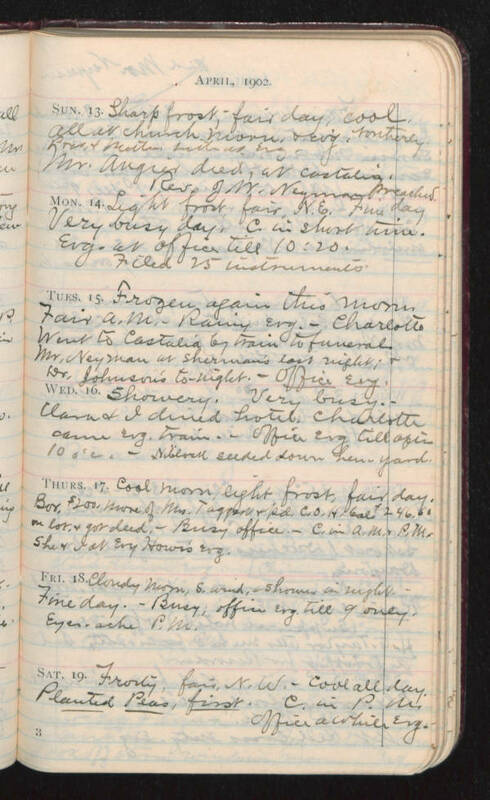 - Charlotte went to Castalia by train to funeral Mr. Neyman at Sherman's last night; & Dr. Johnson's to-night. - Office evg. Wed. 16. Showery. Very busy. Clara & I dined hotel. Charlotte came evg. train. - office evg till after 10 o'c. - Niblock seeded down hen-yard. Thurs. 17. Cool morn, light frost, fair day. Bor. $200 more of Mrs. Taggart & pd. C.O.H. bal $246.60 on lot & got deed. - Busy office. - C. in A.M. & P.M. she & I at [Ery?] Howe's evg. Fri. 18. Cloudy morn, s. wind, - showers in night. Fine day. - Busy, office evg till 9 only. Eye-ache P.M. Sat. 19. Frosty, fair, N.W. - cool all day. Planted Peas, first. C. in P.M. office awhile evg.